We offer customized animal therapy for children, adults and the entire family. We are a Therapeutic Centre on a 35 acre farm in the winery district of Prince Edward County. As a Canadian charity, our generous donors subsidize families with special-needs children who would not otherwise be able to access our services. This learning/healing environment is Relaxed, Gentle, Fun, and Welcoming! 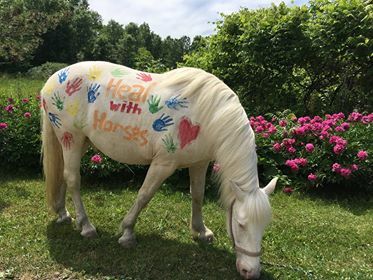 It is a session where you interact with a therapy horse in specific ways. During the session, the horse is teaching you to focus on the present and become more self-aware. Clients can also have hands-on interaction with our small therapy animals, including mini-pigs, pygmy goats, sheep, chickens, dogs and cats.